Evaporative cooling is an efficient and cost-effective way to cool homes and businesses in hot and dry parts of the world. For over 50 years, American Excelsior has been the industry leader in the manufacturing and sales of cooler pads. Our Curlex® excelsior cooler pads are made from the cleanest, toughest, and most consistent all-natural aspen wood fibers available, for superior cooling performance. Unique Curlex® cut fibers enable the fibers to interlock to help prevent sagging for a truly superior cooler pad. Even fiber distribution throughout the pad and around the edges of the pads helps to provide maximum cooling efficiency. 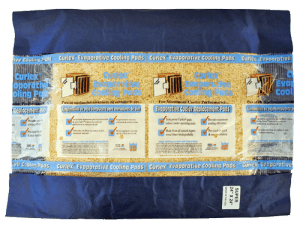 Curlex® cooler pads are packaged individually, on the roll, or in bulk compressed pads in a wide variety of standard sizes. Custom bulk or individually packaged size pads can also be ordered. Individually packaged pads are also ideal for sales through retail establishments.